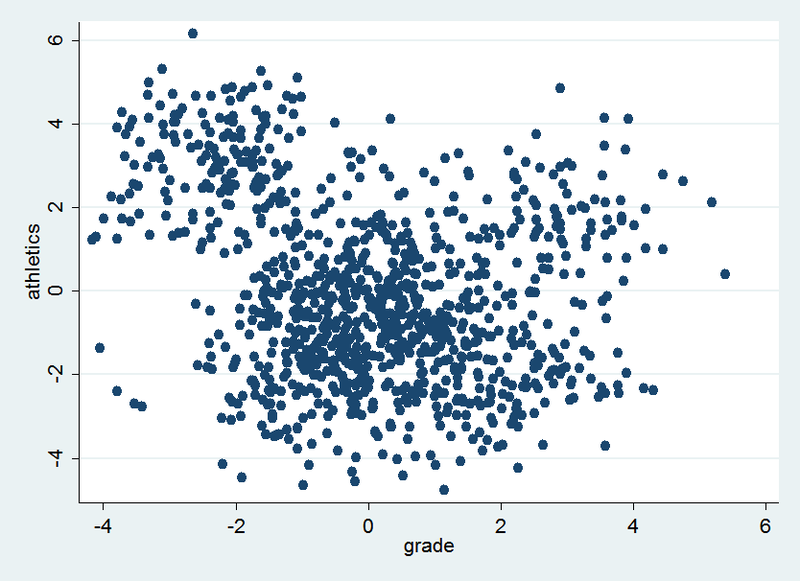 distinct clusters based on observable variation. 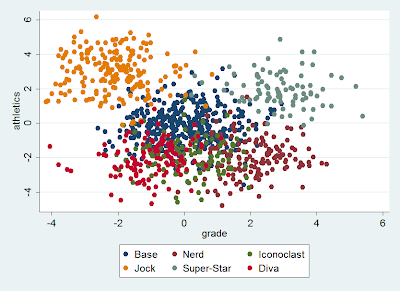 which data is grouped into classes based on observable characteristics. and is usually used for some kind of data exploration. * As with all of my posts, this is exploratory. Please feel free to correct any glaring errors. for each class relative to the overlooked student or the base student. * p1 through p5 is the proportion of students in this class. 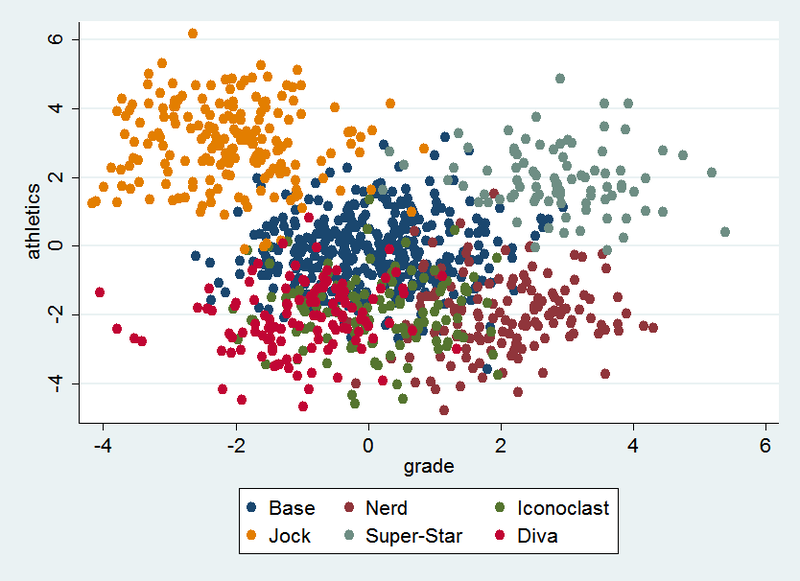 label define Lclass 0 "base" 1 "nerd" 2 "iconoclast" 3 "jock" 4 "super-star" 5 "diva"
* to display what is going on in this nested loop. di "replace `v' = `v' + ``v'`i''*`Cscalar'"
and we would like to impute it. * by the mean values in each variable. 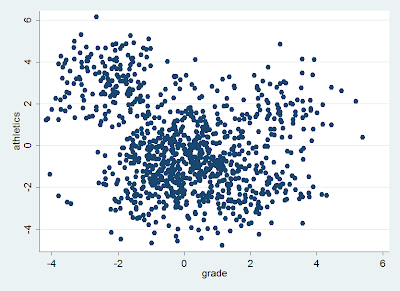 * We can do a cross tab to check how well our clustering worked. * It is looking pretty darn good really. * If we reduce the Cscalar then it becomes more difficult. * lower or greater number. * By doing so we can see that different student classes are grouped together. * probably based on random variation. * In this simulation I got jocks in cluster 4 and 7. * we are incapable of identifying what is the appropriate number of clusters. * them from the values of the observed variables. * athletics, less popularity, and less friends but good grades suggesting nerd. Thanks for the comments! I think I fixed it! Your help on this topic was very much appreciated -- including the useful tool of running mlogit with the clusters as the dependent variable to follow in terms of identifying the factors within the construct of the variable which are most defining of each cluster group.